It has been almost two decades since the government in India re-opened the economy to international investors and brands. During the first dozen years or so, apart from a single visible bump in 1995, every year had a steady dribble of fashion brands coming into the country. It was not until 2005 that this rate accelerated to over 20 international fashion brands entering the Indian market annually, even as the existing brands grew their own retail footprint in the market. 2008 and 2009 were both slightly damp by comparison, reflecting the global economic sentiment, but we were optimistic as we laid out our expectations for 2010. While writing the previous version of our research report released a year ago, we felt that 2010 was going to be promising and it could well be a “curtain-raiser for a new decade of growth for international fashion brands in India”. The increased bustle in the market has endorsed our forecast. Though initially slow, the growth of new international brands entering the Indian market in 2010 bounced back with the same vigour as before the downturn. Some brands that had exited the Indian market earlier also made a comeback as in the earlier years. The most preferred entry route for the international fashion brands entering India in 2010 has been franchise or distribution, with more than half the brands selecting this strategy that allows high control over the product and the supply chain with less intensity of involvement at the front-end. There are two discernible categories of brands that are picking this route: firstly, brands that are usually distributed through department stores and multi-brand independent stores in their home market and other markets, but also those brands that are as yet unsure of their capability to engage intensively with the Indian market. Franchising remained a popular choice in 2010 particularly for the brands looking to test the market or operating in niche or luxury segments. Some brands taking this route for entering the Indian market include Forever 21, Etro, Tom Ford, and Ladybird, amongst others. 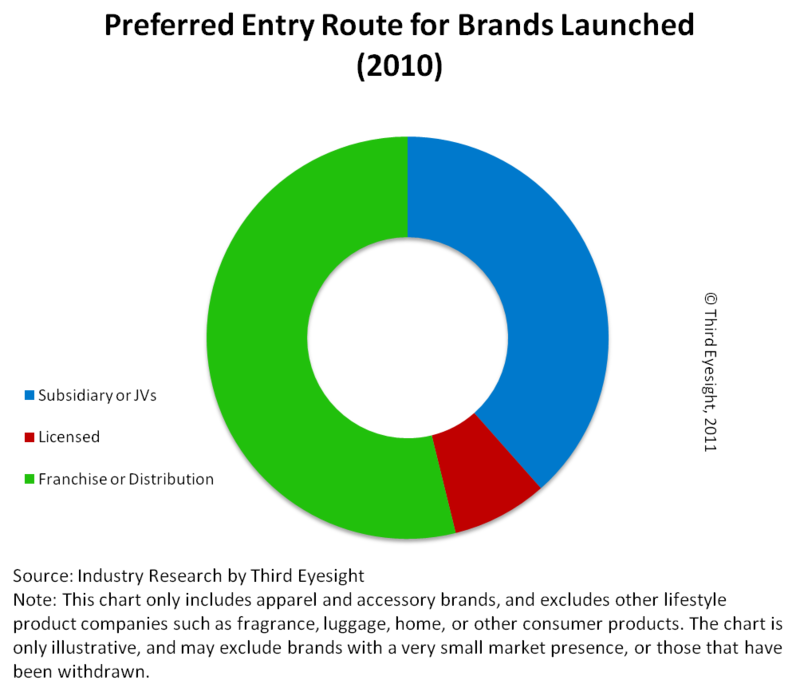 However, a number of brands that entered in 2010 (nearly 40% for the new entrants) also showed that they wanted a piece of the action through some degree of ownership (whether through a majority or minority stake in a joint venture or through a wholly owned subsidiary). Some – such as S. Oliver – also switched to joint-ventures from their earlier franchise structure. Under the current regulations governing foreign investment into retail, several companies that typically want control operate either through 100% subsidiaries that sell to independent retail franchisees , or through 51:49 joint-ventures that operate the stores as well. We are finding increasing signs among companies of a confidence in the market, a growing comfort with the operating environment, and a desire to own and control the direction their brand takes in a strategic market like India. it is likely that if the government decides to allow 100% FDI in single brand retail, several brands will opt to set up wholly-owned subsidiaries that control the entire chain of activities, source-to-store. International brands opting for the ownership in the Indian venture included OVS (Italy’s Gruppo Coin), Yishion (China) and Chicco (Italy). Amongst the new launches, a highlight of the year was the launch of the most awaited and discussed-about brand Zara. The first store was launched in Delhi with menswear, womenswear and childrenswear, followed by a store in Mumbai, and a third again in Delhi. While almost every other brand launches with an advertising blitz, Zara – in its usual fashion – needed none. The news buzz it generated created enough traffic to provide record sales during the first few weekends. It was also instrumental in generating 30-40% more footfall in the malls where it opened. Inditex was certainly one of the brands looking for control, and has formed a 51:49 joint venture with the Tata Group’s retail business, Trent. For now the company has adopted its global supply chain for the Indian market as well which clearly adds cost and time to the supply chain. The merchandise is imported from the central distribution centre in Spain, and includes products manufactured in the Indian subcontinent. Competing brands in the industry have raised questions about Zara being able to build a successful and sustainable business in India just on the back of rapid fashion changes, at prices that are not quite “competitive”. However, the brand is reportedly aware of the struggle in building a successful business around import-led sourcing model and is seen to have planned growth conservatively. Another southern European value fashion brand, OVS Industry, was launched last year by Oviesse through a joint-venture with Brandhouse Retail from the SKNL group. OVS Industry also offers a range for men, women and kids. While in the first year products have been imported from Italy, the company says it intends to bring in the merchandise directly from the supply source for speed and cost effectiveness, to achieve aggressive growth over the next five years. International brands have been drawn to India by its large “willing and able to spend” consumer base and the rapidly growing economy, but so also are Indian companies – manufacturers or retailers – who are ready to act as platforms for their launch. 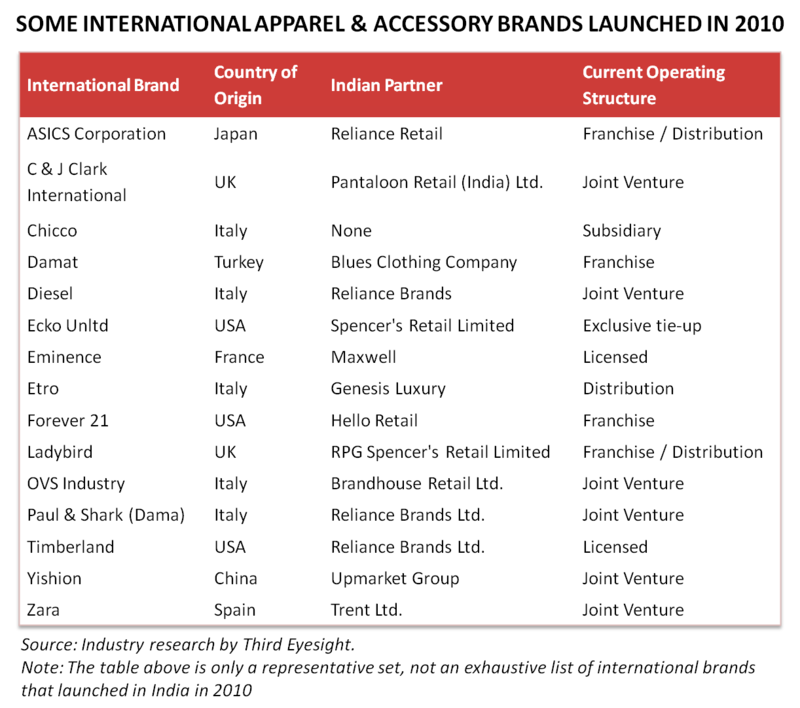 Given the current restrictions on investment into retail operations, Indian companies are increasingly setting up large multi-brand outlets for an array of international brands under one roof. This allows the Indian franchisee to share overheads among many brands, and also negotiate harder for shopping centre space that is increasingly unaffordable. However, the idea is not only to gain from the operational efficiencies and cost efficiencies, but also to capture a higher share of the wallet of the consumers walking into the stores. Even those Indian companies that are already retailing their own brands in a particular category are seeking franchise or distribution relationships with international brands, in order to capture a complementary segment of consumers or to offer a larger choice-set to their existing consumers. For instance, Reliance Brands has partnered with some well known premium to luxury fashion and lifestyle brands. In 2010 alone, it brought Diesel, Paul & Shark and Timberland to the Indian market. On the other hand Maxwell Industries’ relationship with Eminence, a French innerwear brand, has allowed it to address the premium segment in which it was not present, and to compete with other international players such as Jockey, Triumph, Hanes, Fruit of the Loom and others. RPG Group’s Spencer’s Retail, one of the pioneers of modern retail in the last two decades is looking at increasing the share of its apparel business. Apart from its private labels, Spencer’s is also actively seeking to grow its international brand portfolio quickly. Following up on its launch of Beverly Hills Polo Club in 2008, Spencer’s introduced Ecko Unltd (a youth fashion brand) in 2010. It has also become the platform for the British childrenswear brand Ladybird in its second coming to India. While the emergence of large multi-brand franchise outlets is driven by Indian franchisees looking to optimise their businesses, the brands themselves are also looking at larger store sizes that are gradually becoming comparable to their stores elsewhere. For instance, the American brand Forever 21 launched with 10,000 square feet for only women’s western clothing and accessories. Similarly, Zara launched its business with a 14,000 square feet store. Larger stores are allowing brands to increase the efficiency of their operations, maximise the visual impact, and increase the speed at which they can achieve critical mass in the country. While European and American brands clearly dominate, 2010 also saw brands from China, Japan and Turkey making inroads to the Indian market. China’s apparel retailer Yishion launched a 51:49 joint venture with a distribution company, Upmarket Group. Yishion is aiming at rapid growth in the mid price segment in India through own stores and multi-brand outlets (MBOs). Turkish brands Tween, ADV and Damat from the Orka Group have been brought to the market by Blues Clothing Company, a mid-sized retailer of fashion apparel that also distributes brands such as Versace, Corneliani and Cadini. In the past the international brands have undergone changes in their strategy and operating structures to suit their current context and changing environment. Last year was not an exception to the correction and some brands did undergo a change in their approach and strategy for the Indian market. Italian denim brand Energie exited the market and their partnership with Reliance Brands in 2007. However, in 2010, the Miss Sixty group entered into a licensing agreement with Arvind Limited which relaunched Energie as part of its portfolio of international denim brands. Arvind already had international brands catering to the mass and the middle segments of the denim market, and with the launch of Energie, it has achieved brand presence in the super-premium category as well. Another notable denim brand that re-entered the market in 2010 was GAS, also from Italy. After it fell out with Raymond, the brand investigated other relationships, and finally decided to set up a fully-owned subsidiary. The brand was re-launched with one flagship store and through various shop-in-shop counters at Shoppers Stop, the department store chain. The second attempt of the Germany-based casualwear apparel brand Lerros owned by the House of Pearl was ill-timed in 2008. With business coming up below expectations, the company decided exit the business in India. But instead of exiting the market, it granted the license to manufacture, retail and distribute Lerros to the maker of the Indian denim brand Numero Uno. With a complementary product mix, the principal and the licensee are looking to achieve greater success together. Another brand that has undergone a shift in its strategy and the operating structure is the Italian brand Zegna, a world leader in luxury menswear. It was first introduced in the Indian market early on in the decade through a franchise arrangement. In 2005 with 51% FDI being allowed the Zegna Group invested in taking a majority stake in its Indian operations. Last year the brand entered into a joint venture with Reliance Brands Limited with the objective of ramping up its India operations and capturing a larger share in the Indian luxury market. For Reliance, it was a great addition to its international brand portfolio. Compared to 2009, 2010 witnessed hardly any exits, Aigner being one. Overall the year 2010 has been very positive and the pace of new brands entering the market is picking up. Those already present in the market, have been adapting their strategies to grow their India business. The growth strategy for international brands has revolved around lowering the prices and entering new segments. The brands that have rationalised their pricing last year to attract more customers include Adams Kidswear. Previously priced significantly higher than the market leaders in that segment, Adams is looking to change its sourcing strategy and source a part of its product range locally. Similarly, having tasted success in the previous year, The Body Shop not only rationalised prices for more products in 2010, but also introduced new products at lower price points. Another notable trend last year was the focus of international brands on Tier 2 and 3 cities. Marks & Spencer unveiled its plans to enter Tier 2 cities such as Jaipur and Chandigarh and grow its national footprint. Reebok, Adidas, Ed Hardy, Tommy Hilfiger, The Bodyshop and Puma are amongst those that have stated their intent to further expand to such cities. The success of adopting these strategies is bearing results already and the momentum is likely to build further as others follow. For international brands, as for Indian brands, significant challenges remain in the path of growing their business. At the base level is drumming up adequate demand. While India is often compared with China because of similar size of population, the fact is that urban discretionary incomes and the concentration of spend are far higher in China. This reflects in the speed with which brands have been able to ramp up in the two countries. For instance, Mango entered the two markets around the same time. However, a the end of 2010, the network of stores in India was only a tenth the size of the store network in China (100-plus), with over 200 more stores projected to open in 2011. In scaling up, the lack of affordable good retail locations is one of the other biggest hurdles. With the slow growth in 2008 and 2009, brands are significantly more cautious in signing up space at high rentals. Future challenges also remain more at the internal operational level. Retaining adequately trained front-line staff is an issue. Not only does the increasing number of international brands increase the competition for the employee pool, so also does growth in other segments of the economy and it is tough to sell retail as an employment option of first-choice. We expect prices to become more realistic, but also operational efficiency to be a driver. Clustering of stores for efficient management, a concerted drive towards lower cost locations and variable (revenue-linked) payments to landlords are likely to be critical in driving better performance. We also expect many brands to seriously consider scaling up the network to provide critical mass to their business, which can also drive local sourcing of merchandise or direct shipments to the Indian business from Indian and other Asian sources. If the Indian Government announces further relaxation in the foreign ownership norms, we would expect more brands to take equity stakes in the business in India, including the entry of those that wish to operate fully-owned subsidiaries. However, with many different signals from various arms of the government it is best not to try and read the crystal ball too closely on that issue. Despite challenges and barriers, the market is far from being saturated right now as newer product segments and product lines create ever-newer needs. With India being one of the few large economies showing consistently strong performance, many more are considering the Indian market seriously. Among the ones reported to be interested in launching are GAP, Uniqlo and Polo by Ralph Lauren. The market may become more segmented and even fragmented with a plethora of international brands being available. The largest brands currently include Levi Strauss and Reebok which are both reportedly well past the US$ 100 million mark in India, but the race for market leadership is still well and truly on. No matter which brand comes out ahead the winner, without a doubt, will be the consumer.